Cheltenham Music School - Duke Of Edinburgh Gold Award Courses in Cheltenham, Gloucestershire, Cotswolds. Peter Gill Rock School. If you play an instrument at Grade 5 minimum and you'd like to perform along with other musicians then this is the course for you. 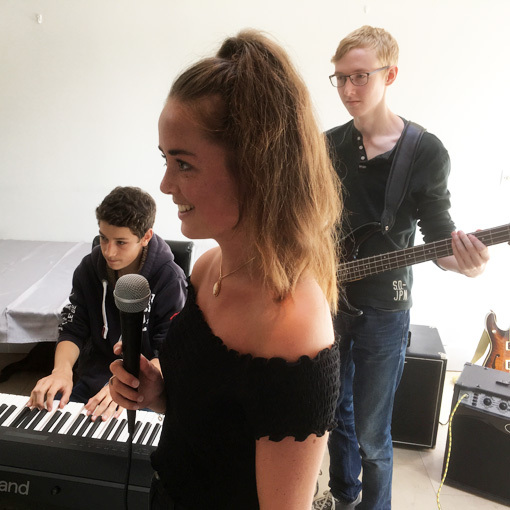 You will be choosing favourite songs and writing your own new song during the week leading up to a performance for family and friends at the end of the week. Under the guidance of dynamic and energetic tutors you will learn about all aspects of playing in a band. These will include performance skills, technical matters, using all the equipment and song interpretation. The main focus every day will be on learning to perform just 3 or 4 of the most popular chart hits of recent years. The second main activity will be writing and performing your own new song, with plenty of guidance and help. We will keep aside a daily hour or so for dipping into useful music theory and touching on other genres including jazz, classical and soul and blues music etc. The group will be encouraged to work with their own preferences as the week unfolds. All students will be offered the chance to sing and play percussion instruments to develop a better sense of rhythm. Communication skills are the most important part of all the DofE residential courses. Over the five days you will learn to communicate better, both musically and verbally, with those of different ages and different abilities in an environment that is supportive and encouraging. "The course taught me loads and was so much fun!" "Thank you for an amazing time learning great songs last week"
Copyright © Cheltenham Music School. All rights reserved.